Trees, of course, have an enormous cultural importance around the world: they are magic, mystical, life-giving (and –taking), and even represent in the well-known world-tree mythologies a bridge between earth and the worlds below and heavens above. 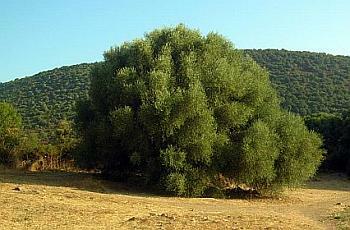 That S’Ozzastru is an olive tree (Olea europaea) and important since there is nothing as iconic of Mediterranean cultures as the olive tree. It is a symbol of prosperity and power, and is mentioned abundantly in the Bible and in Greek mythology; we offer the olive branch of peace, and the groves of Academe, where Plato walked, were olive groves. Gnarled old Ozzastru is not particularly stately, not the kind of towering tree that inspires comparison to cathedrals and such. You don’t hear organ music in the branches. But you do hear something softer, older and perhaps wiser —murmurs, whispers and maybe a few grumbles, as well. Indeed, S’Ozzastru has had to put up with insults of the ages, both natural and man-made. Now that he is protected by law, he should be around for a while longer.